A spacious detached single storey family residence with a self contained annexe situated within the exclusive Coombe House Estate off a very countrified lane with a South and West facing garden and over plot of 0.62 of an acre. The property offers scope to increase the size of the accommodation. We are delighted to offer this three bedroom detached single storey family residence with a self-contained annex ideal for a living in couple, elderly parents or to let out. 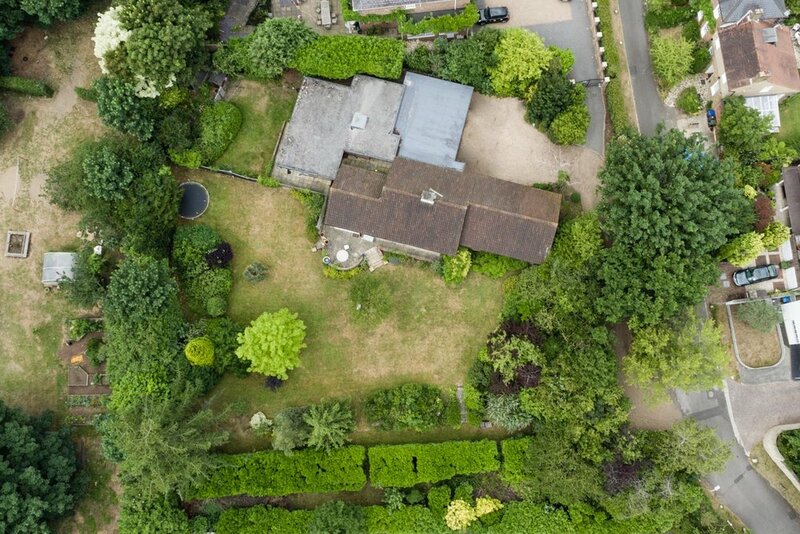 Situated within the exclusive Coombe House Estate, off a countrified lane, this property benefits from a South/West facing garden and a plot of 0.62 of an acre with ample potential for future development subject to necessary planning consents. Warren Rise is a countrified lane within the exclusive Coombe House Estate which sits conveniently between two major town centres, Kingston and Wimbledon. Both have excellent shopping facilities, from department stores housing concessions found in famous West End Streets and specialized boutiques to a wide range of restaurants meeting the palates from across the world. The A3 trunk road offers fast access to central London and both Gatwick and Heathrow airports via the M25 motorway network. The nearest train station at Raynes Park is within walking distance, and the 57 bus route runs along nearby Coombe Lane West to Wimbledon from which there are frequent services to Waterloo with its underground links to points throughout the city. The immediate area offers a wide range of recreational facilities including five golf courses, tennis and squash clubs and many leisure centres. The 2,360 acres of Richmond Park, area of outstanding beauty easily accessed from Kingston Gate and Ladderstile Gate, provide a picturesque setting in which to picnic, go horse riding, jogging or just take a leisurely walk. Theatres at Wimbledon and Richmond are also popular alternatives to the West End. There are numerous excellent local schools for all ages, private, state, and a variety of international educational establishments many within walking distance. Warren Rise can be approached from Coombe Lane West directly opposite the entrance of Warren Road and the property is found on the right half way down or on the left if approached via Neville Avenue off Traps Lane. The gravelled forecourt leads to a triple garage, and glazed double doors opening onto a spacious entrance hall with wood strip flooring. Open shelving separates this area from the drawing room, and also offers access to the guest cloakroom, which comprises a vestibule with a wash hand basin and a separate WC. The double width drawing room benefits from large windows overlooking the rear garden, a wood burning stove inset into a large painted brick surround and marble base, flanked by book shelves. 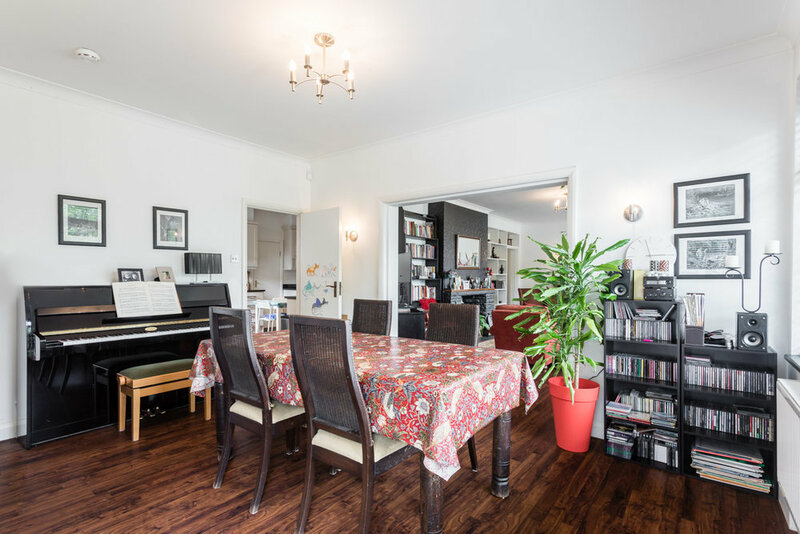 A large opening leads to a bright dining room with views of the rear garden with access to the double aspect garden room with floor to ceiling sliding doors leading to the rear patio. The study is located adjacent to the dining room. The Kitchen/Breakfast room offers a range of painted wall and base units with a one and half bowl sink recessed into a granite worktop with a tiled splash back and ceramic tiled floor. The Bosch range of integrated appliances includes four ring induction hob with stainless steel extractor hood, dishwasher, double ovens, microwave and a fridge/freezer. There are several other built in cupboards, space for a breakfast table in the middle and a door to the utility room. This has space and plumbing for washing machine and tumble dryer and a window and door to the side of the property, where a small courtyard is nestled between the main property and the annexe. There is access to the triple garage, as well as a door to the front driveway. The entrance hall also opens into an inner hall serving the sleeping quarters of the bungalow with two airing cupboards and loft access. The double aspect master bedroom enjoys views over the rear garden, with built in wardrobes, as with the other two bedrooms. The spacious family bathroom benefits from a white suite comprising of a fully tiled panelled bath with glazed screen with tiled floor and partially tiled walls, low level WC, a wall mounted wash hand basin. The rear patio is accessed from the garden room and with two sets of steps down to the mainly laid to lawn garden, which extends to 103ft. and is well bordered with mature trees and shrubs, creating a very private and secluded garden. Approached from the front driveway, this self-contained annexe is newly refurbished, and benefits from spacious accommodation and a west facing garden. 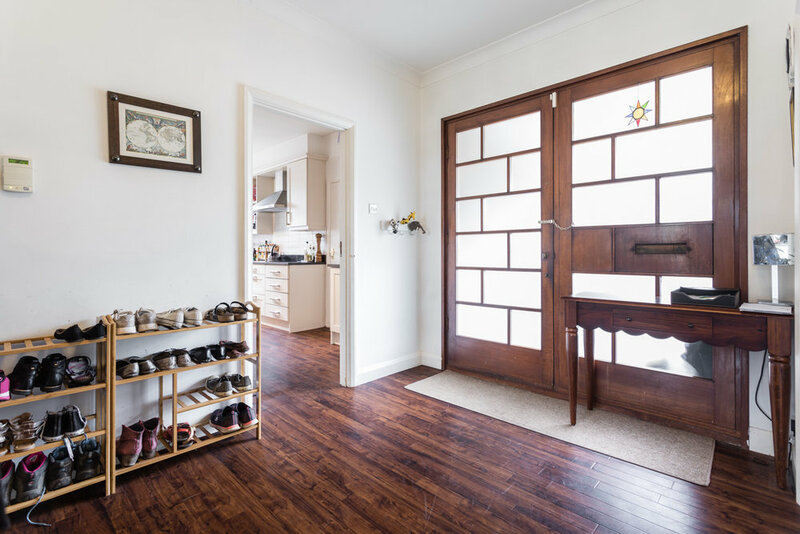 The entrance hall is spacious with a deep walk in cloaks cupboard and a glazed door leading into the rear aspect reception room which has access to the rear patio and garden through French doors. The kitchen/breakfast room benefits from a side aspect with views over the garden, wood panelled ceiling and a range of wall and base units, with laminate worktop and stainless steel sink with drainer and an Indesit oven. The utility room houses the boiler and has space and plumbing for washing machine and tumble dryer. The double bedroom with a window to the front, has built in wardrobes and an en suite bathroom with tiled floor, half tiled walls and a white suite comprising low level WC, wall mounted wash hand basin with mixer taps and vanity below, and a fully tiled panelled bath with glass screen. The west facing rear garden is accessed from the reception room and is bordered with mature hedges to one side, a fence separating it from the main garden and a garden shed. There is access to the front path via a wooden gate.